Abstract: Intel demonstrated a concept PC at Comdex Fall 2001 that was designed to make anyone's mouth water. Intel demonstrated a concept PC at Comdex Fall 2001 that was designed to make anyone's mouth water. Looking at the machine in the Intel suite it was easy see why computing never gets boring, and why Intel will always have a strong future, even it AMD continues to out do their chips on sheer performance. So what was in the Hannacroix Concept PC - was it alien technology, Fluorescent Multilayer Disks, or just plain old current day tech with a new spin? Well it was a little bit of everything (sadly no FMD's were present) designed to feel out what could be the best path to move towards. The theme was obvious "access anytime, anywhere." To illustrate this concept, seven up and coming technologies were highlighted; Wireless 802.11, Bluetooth (IEEE 802.11b), Firewire (IEEE 1394), USB 2.0, DVI (Digital Video Interface), MPEG-4, and Serial ATA. The most tantalizing aspect of the Hannacroix system for us was Serial ATA. Sure Bluetooth is cool, but Serial ATA (expected in 2002-3) is where the money's at. Serial ATA (www.serialata.org) is a scalable architecture used to connect hard drives, DVD's, CD-RW's and other internal storage devices to the motherboard. 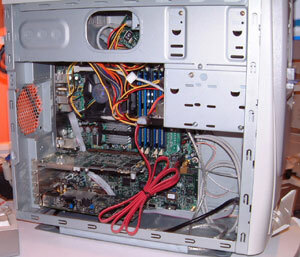 Most desktop computers currently use 40 or 80 wire IDE cables to connect hard drives and CDROM's to the motherboard. Serial ATA promises to offer speeds of 150MB/s (SATA-1) scaling up to 600MB/s (SATA-3), more device connects, simpler integration and all the while just using four wires. Initially Serial ATA-1 at 150Mbps will be introduced. This will then migrate to Serial ATA-2 at 300Mbps and final end up with Serial ATA-3 at a blisteringly fast 600Mbps. Serial ATA is a hot plugable technology which relies upon a four wire physical layer and uses a much lower voltage of 250mV compared to 5V for current IDE interfaces. One interesting difference of Serial ATA compared to existing IDE interfaces is that SATA uses a star topology, meaning that one cable is connected to one device only. DVI (www.ddwg.org ) has been around for a while now on the backs of many flat screen LCD monitors, and on the majority of high-end video cards. The standard allows computers to communicate with digital displays directly, rather than exclusively through the current 15-pin analog video standard. For entirely digital devices like TFT LCD displays it simply makes more sense to keep the signal all-digital, and it also results in technically superior display quality. There are a few different variants of the connector, but the underlying technology is pretty much the same. The main illustration of this can be seen on some early Mac computers which used a slightly rounded cable to connect to the DVI cable from a display. Firewire is technically a proprietary name given to the IEEE 1394 standard by Apple. IEEE 1394 (www.1394ta.org) is a high speed interconnect designed for uses similar to that of USB, but operating at 400Mbps rather than 12Mbps. It is mainly used in conjunction with external hard drives, digital video recorders and other high data products. USB2.0 now also offers similar data transfer speeds. While USB (www.usb.org) has been a standard for quite a long time, USB2.0 is only now starting to find itself as an add-on to motherboards. MSI were one of the first to offer a USB2.0 enabled motherboard with the K7T266Pro-RU. 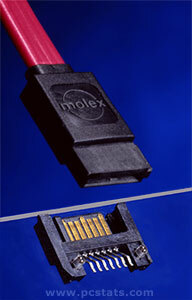 USB2.0 has improved over its original namesake by about 40 times to offer data transfer rates of up to 480Mbps. While there are only a few products available to take advantage of USB2.0 transfer speeds, each device is backwards compatible with the original USB1.1 standard making a very versatile interface for the coming months. Wireless LAN (www.wirelessethernet.com) and Bluetooth have been such a hot topic over the last year that it is somewhat disappointing to not see the technology is wider use. This should be changing soon as a host of access points, wireless hubs and USB-Bluetooth adapters and other devices get ready to hit the mainstream marketplace. Unfortunately we are still sometime away from seeing wireless LAN and Bluetooth as integrated features on a motherboard. The Bluetooth (www.bluetooth.com)standard enables computers to communicate without wires up to a distance of 10 meters or so. Wireless LAN makes use of an antenna and offers longer ranges. The prototype Hannacroix system demonstrated all of these technologies in a converged environment and also promoted the MPEG-4 standard which we did not touch upon. 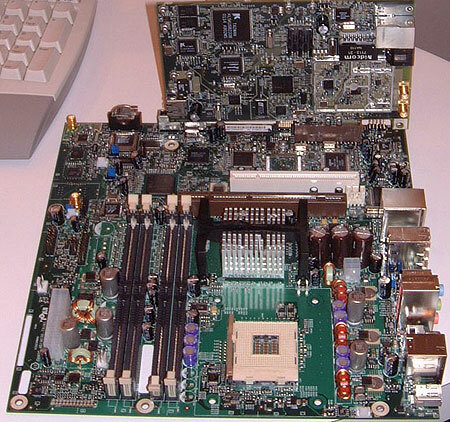 The Hannacroix system board on display at Comdex Fall 2001 was based on the i850 chipset running a Pentium 4 socket 478 processor with RDRAM. Given that the intent was simply to demonstrate a multitude of different technologies the I/O ports were completely legacy free - that means no serial, PS/2 or parallel ports were included. The system was a very interesting display of converged technologies but underlined the difficulties consumers will face in the upcoming months as so many technologies vie for dominance in the market. A prime example of this potentially deadly confusion was a port on the front of the computer which offered support for a handful of flash storage platforms (Memory Stick, SD, Compact Flash, Smartmedia). The system also came packing no less than (11) USB2.0 ports, (3) 1394a ports, an Intel Pro/100 VE network connection, 6-channel analog audio and S/P-DIF, onboard Bluetooth, integrated Serial ATA, home gateway CNR card (with 802.11, 802.11b, USB2.0 fast Ethernet, HNPA2.0 and USB2.0), an ATI 4X AGP TV tuner card, an On-Spec SmartMedia drive, and a Samsung DVD/CD-RW Combo drive. With so much emphasis on integrated peripherals and networking it is safe to say the future of computing will not be disappointing in any way.